Serge Abecassis, born in Paris, France, founded his first company in 1992. As the lead designer and CEO, Serge was responsible for the creation and development of multiple brands, throughout his career. ANC, his first company, was a wholesale men’s neckwear company doing business with better department stores like Nordstrom’s, Lord & Taylor and Saks Fifth Ave, under the company’s label Tongue Tied. ANC later acquired Zanzara Intl., merged both companies, and did business under the Zanzara name. Zanzara, later became a major force in the neckwear and dress shirt industry with the companies Zanzara and Zinc labels and licensed brands like Jhane Barnes, HBO The Sopranos, PGA Tour, and many others. In 2006, Serge Abecassis co-founded Silver Dagger, LLC, the corporate arm of the “Silver Dagger” brand. Serge’s extensive talents in art and graphic design combined with over 20 years of operational experience in the fashion industry has enabled him with the ability to implement his visions accurately and fulfill his lifelong dream of creating a brand that reflected his love for edgy sophistication, a brand that would favor every person’s need to ex­press their own individuality. Serge utilizes his expertise in the fashion industry to coordinate the multi facets of the company. By 2009, Silver Dagger became a lifestyle brand, encompassing Men’s, Ladies and Children’s apparel and accessories, eyewear and a line of Ultra Premium Vodka. The brand was sold in better boutiques in over 40 countries. Serge later also created and developed Hard Rock Vodka, in a venture licensed by Hard Rock, which was recently sold. In 2012, Serge Abecassis founded Prodigy Brands and launched the Bugatchi shoe collection. One year later, Prodigy Brands added JOE’S men’s shoes to the company’s assortment. In 2014, the company added designer socks to its stable of products and re-launched its proprietary brand Zanzara. Today both Joe’s and Zanzara are rapidly becoming staples in the men’s shoe and sock arena. Prodigy Brands is continuing the expansion of the Zanzara brand to other products, starting with Neckwear and Dress Shirts, which were recently introduced. 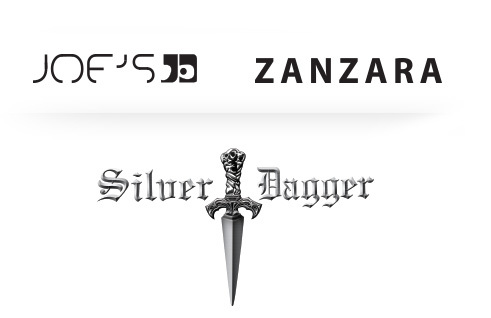 The Zanzara brand will continue to evolve, and eventually become a complete lifestyle brand. In a continued effort to expand, a luxury sneaker brand was just launched by the company under the name Silver Dagger, with shoes ranging from $200-$500 at retail. Our design, sourcing and production capabilities are the heart and soul of the company. With over 25 years of experience in these areas, we have an established presence in the heart of the industry. With strong production relationships in China and Italy, our company is well prepared for all product types and price points. Our vertical development capabilities make us the optimal partner for any brand to conceive, develop, sample and manufacture a product reflecting the DNA of each of the brands and delivering a product assured to perform exceptionally at retail. We have long lasting relationships and partnerships with the top manufacturers in the region, which we work hand-in-hand to produce our brands in the appropriate time line needed. Each of our manufacturing partners is taught our standards, our quality and our expectations to guarantee a consistent product from season to season. The success of our product is made possible because of our sophisticated Quality Control tactics. Our partners manage every step of our sample and production procedure with very strict instructions to analyze each step and every product to the precise standards our company is used to. Our sourcing team is always searching the optimal regions to get the best materials needed for each product line. Our materials and accessories are sourced from Europe and Asia to assure the best quality and diversity necessary to make our product quality and exclusivity better than anyone in the industry. For all the reasons above, we continue to excel in development and production. Prodigy Brands’ sales team covers the entire spectrum of retailers. Our bands are found in all the department stores, chain stores, specialty boutiques, resorts, country clubs and Off-price chains in the USA and Canada. The company has showrooms in New York and Florida. We also show our brands in all the key trade shows including FN Platform in Las Vegas, FFANY in New York, Project in New York and many other regional shows throughout the country. Internationally, we have showed our brands at Bread and Butter for many season which helped develop a network of distribution in 40 countries. This will become a focus again with our new brands. Marketing is an integral part of sales. Our marketing team supplies all necessary materials to our sales team and to our customers to help sale the products to the retailers and help the retailers sell the brands to the consumer. We continuously update our point of purchase materials and informational materials to keep our brands in front of the buyers and consumers. We will also work in unison with our retail partners to create specific marketing material for their individual needs. We will customize a marketing strategy for each retailer based on their demographic and even develop gift with purchase programs and other incentive driven offers. We understand that we are partners with our customers and stand behind selling our brands. © 2015 Prodigy Brands -.All Rights Reserved.